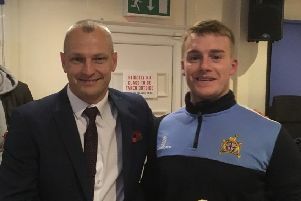 Clitheroe boss Simon Haworth hopes his side can continue to punch above their weight in the Evo-Stik First Division North – and maybe go one better than last season. The Blues finished seventh, two points outside a play-off berth, and reached the semi-finals of the Integro League Cup and LFA Challenge Trophy in Haworth’s first season in charge. Clitheroe kick-off the new term on Saturday at home to Droylsden, before a trip to Glossop North End on Tuesday, and Haworth is in good spirits on the eve of the season: “If I’m being honest, a top-10 finish would be doing well – we over-achieved slightly last season. “It will be tough, but hopefully we can do the same or go a step closer. “There are a lot of strong teams – South Shields have the finance and beat FC United 3-0 in pre-season, two divisions higher. “Scarborough are back home and have brought a lot of players in, and then there are around 10 of us, including ourselves, Colne, Bamber Bridge, Ramsbottom, with not much between them. “It’s exciting, and hopefully we will be competitive again. Haworth had an exciting young side last season, but a number of promising positions in games were squandered late on, down to a lack of experience in the main. And he is pleased to have added a more muscular presence up front in Sefton Gonzales, returning to Shawbridge. Skipper Danny Brady has joined FC United, but Haworth said: “Danny is a loss, but it was a great opportunity for him, and he spoke to Sefton about us. “We were a bit raw and naive last season, and a bit one-dimensional. “I felt we needed more experience, there were a lot of games we should have seen through from good positions.